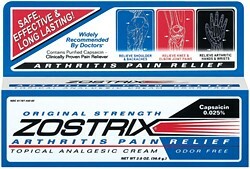 Zostrix contains a powerful natural pain reliever derived from red hot chili peppers called capsaicin. Years of research have gone into creating the superior formulation of purified capsaicin that is found in Zostrix. Zostrix is not only effective, it's also safe. Zostrix has no known systemic side effects or drug interactions. This means that you can feel comfortable knowing Zostrix will not interfere with the oral medications that you may take for arthritis or other conditions.